100% NEW OEM 12W USB POWER ADAPTER. iPad Mini Air iPhone 3 4 5 6 7 8s X. 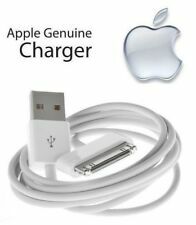 -HIGH SPEED CHARGING FOR APPLE PRODUCTS. Cable not included. This is NOT a third-party knock off. It's the real deal. It's just a little slimy; it's still good, it's still good.". BRAND NEW NEVER BEEN USED, 100% NEW AND FULLY FUNCTIONAL. SATISFACTION GUARANTEED. Original Apple Lightning Cable, This is 100% Original. Original Apple Lightning to USB Cable. Lightning to USB Cable. iPad mini, iPad 4th Gen. iPad Air One, iPad Air 2. Reversible direction lightning connector. Apple iPad Pro 9.7" / iPad Pro 10.5" / iPad Pro 12.9". 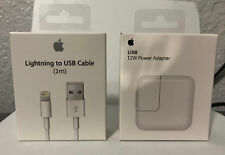 - Apple USB to Lightning Cable x 1. We Will Try Our Best To Reply Back With In 24 Hours. 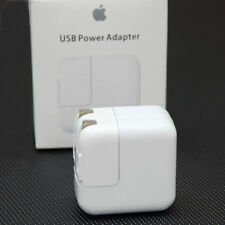 This Apple Dock Connector to USB Cable is compatible with both the Apple iPad and iPad 2 when used directly with an Apple computer or AC adapter. The Apple Dock Connector to USB Cable is also compatible with Apple iPad, iPad 2, iPhone, iPhone 3G, iPhone 3G S, iPhone 4, Verizon iPhone 4, iPod Touch, iPod Touch 2nd generation, iPod Touch 3rd generation, iPod Touch 4th generation, 1st 2nd 3rd generation iPod, iPod Photo 4th generation, 5th generation iPod Video, iPod Classic (6th generation), 1st and 2nd generation iPod Mini and 1st 2nd 3rd 4th 5th 6th generation iPod Nano. What: Brand new Apple Products ( no original boxing included) -iPad 10W Cube Any question, please feel free to ask. • 1st Generation iPad. • iPhone 3G. • iPhone 3GS. • iPhone 4. • iPhone 4s. 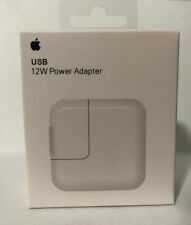 Original OEM 12W Power Adapter. High Speed Charging for all Apple Products. Original OEM 12W Power Adapter and Lighting Cable. High Speed Charging for all Apple Products with Lighing Plug. 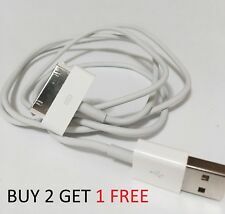 100% Apple Original USB Cable for iPhone 4/4s, Also can be use for iPad 1/2/3 & 4. 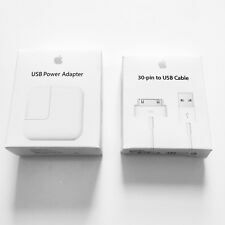 This Genuine Apple USB 2.0 cable connects your iPhone or iPod - directly or through a dock to your computer's USB port for efficient syncing and charging or to the Apple USB Power Adapter for convenient charging from a wall outlet.